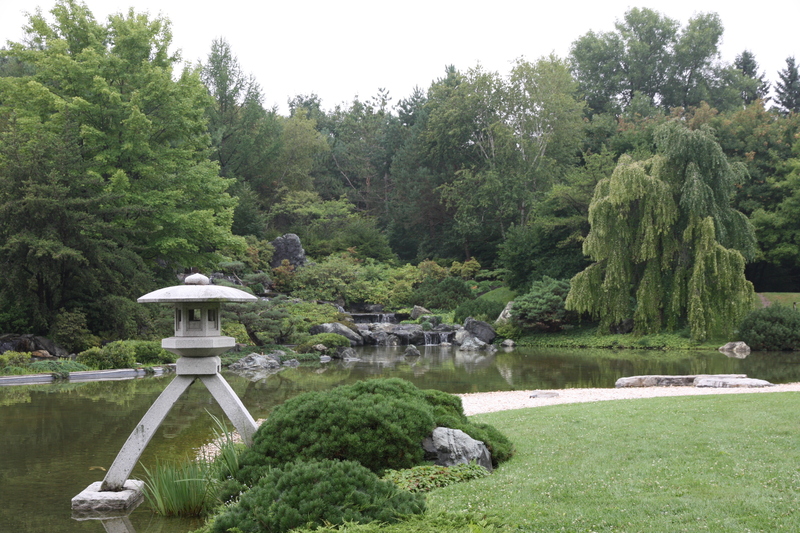 Japan a hit in the Montreal Botanic Garden | Where to next? I have already written about the Montreal Botanic Garden in general and now I’d like to introduce its exquisite Japanese garden. Opened in June 1988, this show-stopping area combines stone, water and plants to create an environment that is both serene and sophisticated. Ken Nakajima designed the 2.5-hectare garden and carefully specified the placement of every stone, flower, tree, shrub and water feature. There are peonies, rhododendrons, irises, crab apples and many perennials. A large stone sculpture sits at the edge of a small lake stocked with the colourful carp, called koi. There is also a cultural pavilion, designed by architect Hisato Hiraoka, with exhibition halls that have displays on bonsai and penjing, artwork, the tea ritual and other aspects of Japanese life. We saw an elegant wedding gown created by businesswoman Keiko Ichihara and made out of Mino paper. Ms Ichihara is trying to preserve traditional Japanese paper craft by developing innovative ways to use it. I plan to post items about the cactus, bromeliad and begonia areas of the botanic garden, so come back for more. That looks lovely. All that stone and the water features combined with the plants; wow! Thank you for such lovely photos. Glad you like them Louise. the Japanese garden is so tranquil. Stuck on cacti at the Montreal Botanic Garden « Where to next? Showy bromeliads at Montreal Botanic Garden « Where to next?